Air Transat offers a variety of in-flight services to make your trip even more enjoyable. Read about entertainment, food and drink, the duty-free offerings and more. How much does your in-flight experience impact your over all holiday experience? Many people we asked said it had a huge impact after all your flight starts off and ends your journey. Here are some of the amenities Air Transat offers its guests while on board. 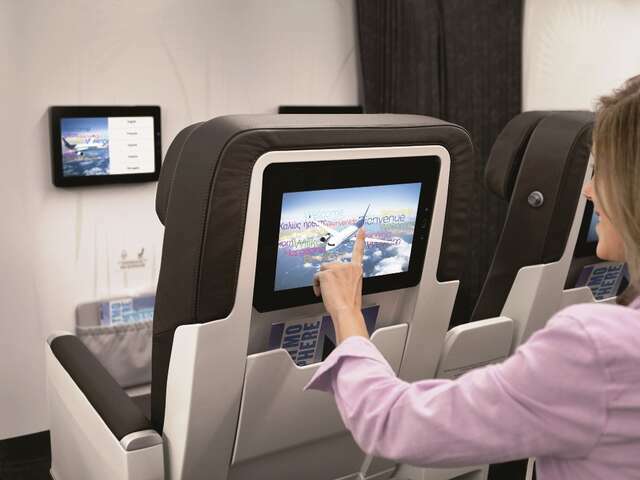 Like many airlines, Air Transat offers guests a variety of entertainment options. But did you know that the airline continues to invest in its fleet to provide the best in-flight experience in the country. The options available to you will depend on the aircraft you are flying on. Check out the selection of movies, TV shows and music and find out what will be playing on your next flight. On flights to/from South destinations and the U.S., Air Transat offers a vast selection of bistro-style meals such as sandwiches, pizzas, breakfast items, snacks and more, available at affordable prices. View pricing and options available. Earlier this year Air Transat launched its new and innovative meal service on Trans-Atlantic flights free of charge. These Euro Bistro meals lets you choose from a variety of six hot or cold main courses, including five hearty sandwiches and Vegetable makis (nine pieces). The meal also includes a 5 oz glass of wine or non-alcoholic beverage, as well as dessert. If you are travelling internationally you can shop Air Transat’s duty free store and save 15% to 40% on the suggested retail price of various items, including chocolates, cosmetics, fragrances, jewellery and much more. During the flight, browse through the airline's duty-free magazine located in your seat-back pocket. Choose from designer name brands such as Ralph Lauren, Calvin Klein, Giorgio Armani, Chanel, Lancôme, Burberry, and Anne Klein. Once you've made your selection, you can purchase the items from the duty-free trolley – right from your seat! Convenient on-board shopping is available on all Air Transat international flights except on pre-cleared flights to the U.S.
Are you flying on Air Transat, or thinking about it? Give us a call and we'd be happy to answer any questions.